When Deanna from Sew McCool came up with her 12 Days of Christmas Holiday Blogger Challenge I knew exactly what I would make. It’s her blog anniversary and she’s gathered a bunch of us bloggers to celebrate with a challenge. We are to post a tutorial or holiday-related craft on our designated day between the 1st and 12th of December. At the end of the challenge there will be a chance to vote for your favorite and the winner will win $100! And with that challenge, an idea I’ve had in my head for almost a year is finally realized. When you sew there are different needles to use depending on which fabric you’re using. If you choose the wrong needle it can make your stitches skip, bobbin thread tangle, or totally ruin your fabric. For the past year, every time I’ve gone to my pin cushion to look for the right needle to use for whichever fabric I was sewing with at the time it’s been a nightmare to figure out which needle is which. I know that some needles are color coded, but honestly that paint seems to wear off before the needle is no longer usable. There are also charts out there that will tell you which needle to use and why each one is different, but unless you have a magnifying glass handy it can be tough to figure out just how the end of the needle is shaped. 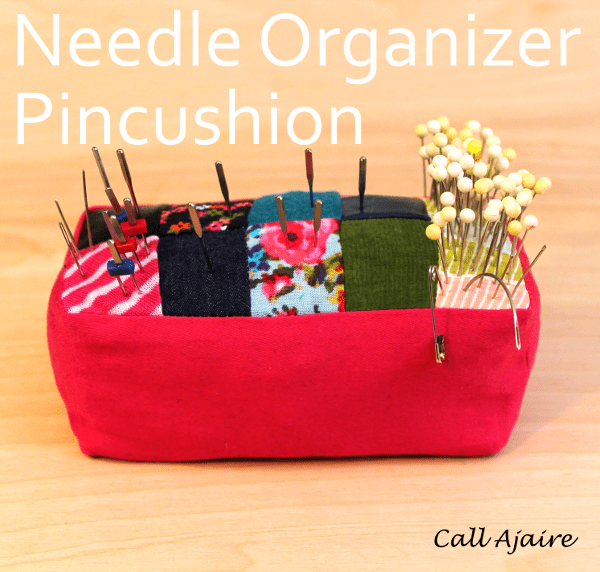 Enter the Needle Organizer Pincushion. Using different types of fabric to represent the storing place for each type of needle eliminates the guess work. Faux suede is where the microtex needles are stored, swimsuit fabric is where the stretch needles are stored, leather for leather, denim for denim, etc. 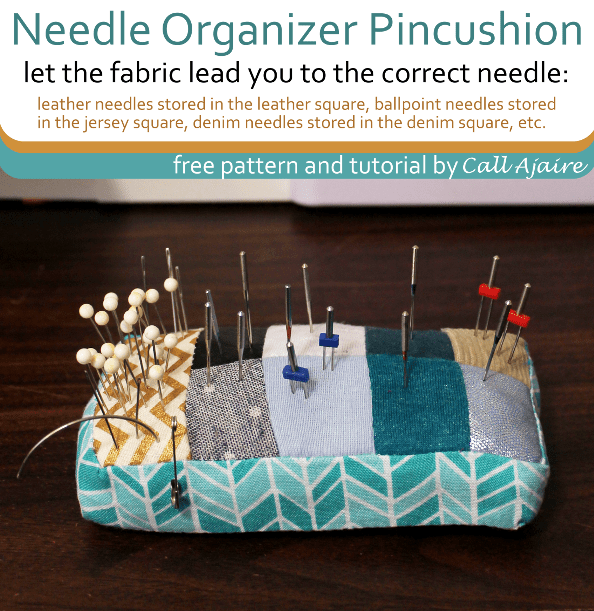 Customize the pincushion with the type of fabrics you work with most often and you’ll have the needle you need right at your fingertips instead of shoved in a drawer or buried under the pins. 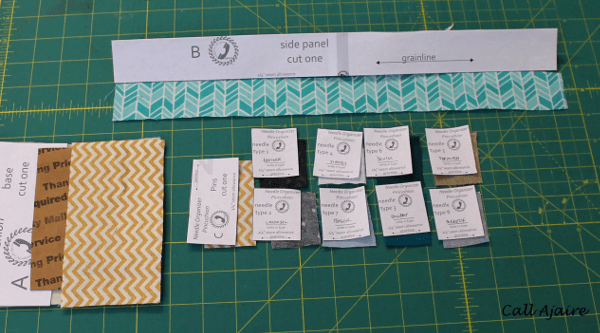 Once you’ve downloaded the pattern, print the pages, and tape them together according to the included instructions. You’ll find a suggested needle types list with the pattern pieces which might be helpful in planning your pincushion. 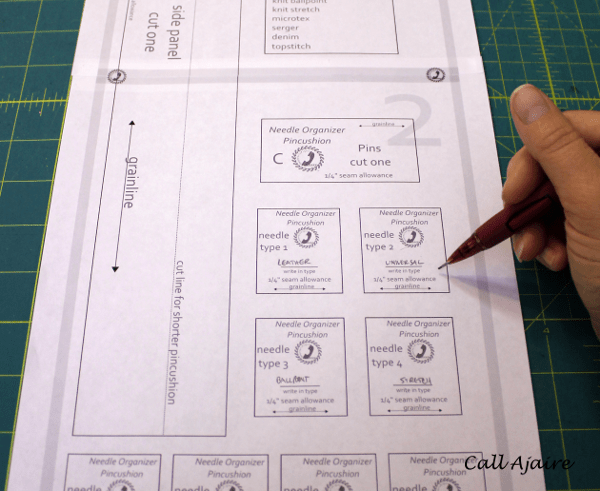 Before cutting out the eight needle type pieces, write in which type you will be using for each. The eight needle types that I used are: ballpoint, stretch, universal, leather, microtex, topstitch, serger, and denim. The pattern piece (C) that is twice the size of the needle type pieces is meant for quilting cotton and it’s where I store all of my pins, safety pin, and hand sewing needles. 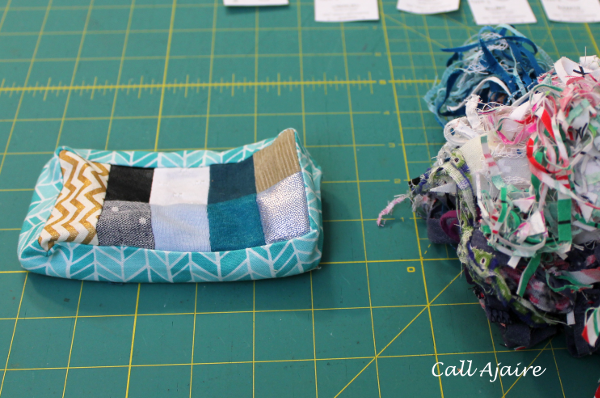 Decide if you want to sew a tall pincushion (like the earlier pink one) or a shorter pincushion (like the blue one above). 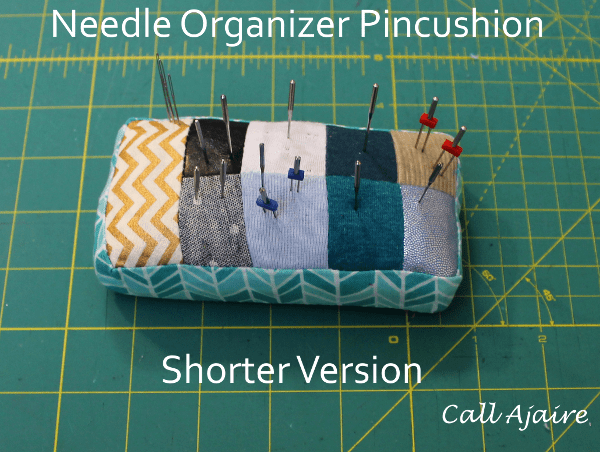 If you want to sew the shorter pincushion, simply cut off the excess at the dashed line that says “cut line for shorter pincushion.” Then you are ready to cut out all your pattern pieces and the corresponding fabric scraps. For the base, don’t forget to cut out one main piece, two pieces of felt, and one piece of cardboard or something similar to help keep the pins from pushing all the way through the pincushion. There are dashed lines on the pattern piece (A) for cutting the correct size piece of cardboard. 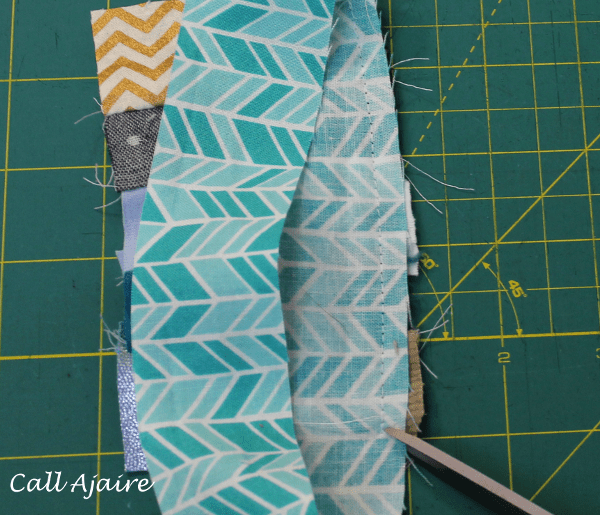 Sew the needle type fabric pieces together in whichever order looks best to you, using the 1/4″ seam allowance, and sewing four of the needle fabrics together twice to make two rows. 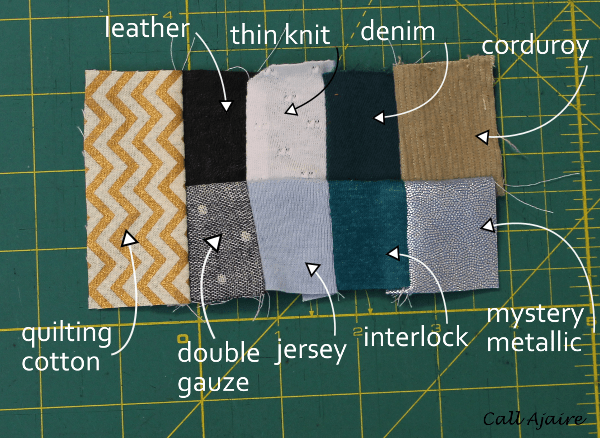 You may be wondering what type of needle should be used when sewing all these different types of fabrics together and for me the microtex seemed to work the best. Once you have two rows of four needle type fabric pieces sewn together, sew the two rows together, taking care to match the seams. 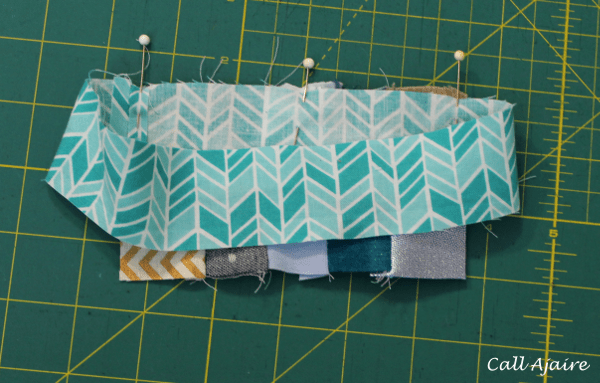 Finally, sew the longer pin section piece (C) to the end of the sewn together rows to match the picture above. 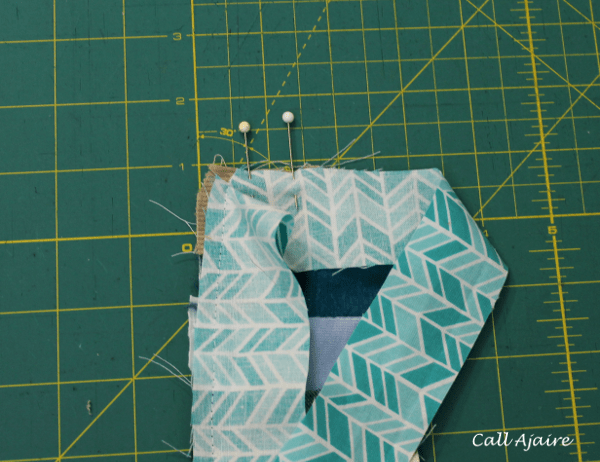 Sew the two short ends of the side band piece (B) together to form a loop. Pin the edge of the loop, right side together with one side of the pincushion top, placing a pin to mark 1/4″ away from each end. 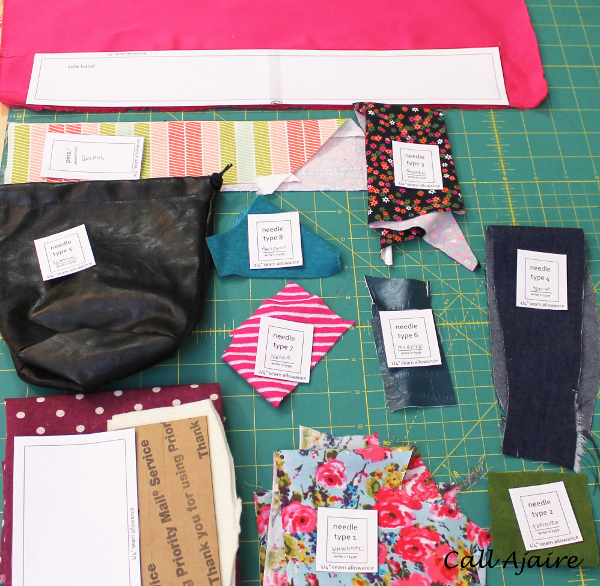 Sew with 1/4″ seam allowance, starting and ending at those pin markers. Clip the side band fabric only (not the pincushion top) at an angle right to the stitching at the corners, taking care not to clip the stitches. Twist the loop around to the next side of the pincushion top and pin along the edge, placing a pin marker 1/4″ away from the end. Sew along this edge, stopping at the pin marker and clipping the corner as before. 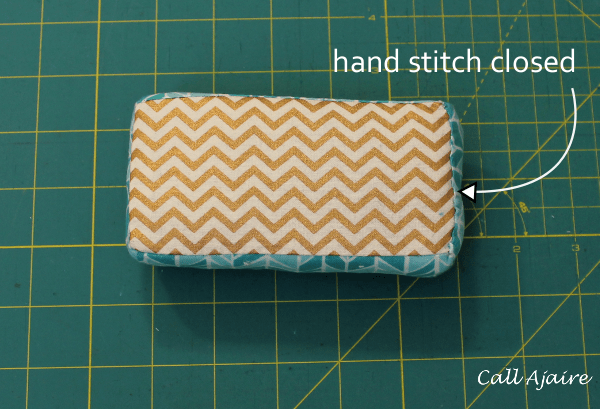 Continue sewing the side band to the pincushion top in this manner, all the way around. 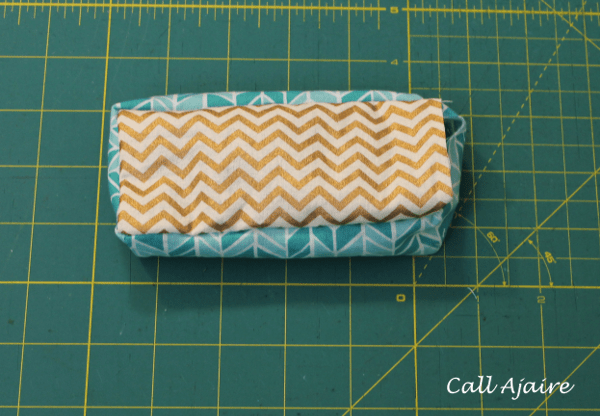 Clip the corners through both layers so they will form a crisp point and turn the pincushion top right side out. 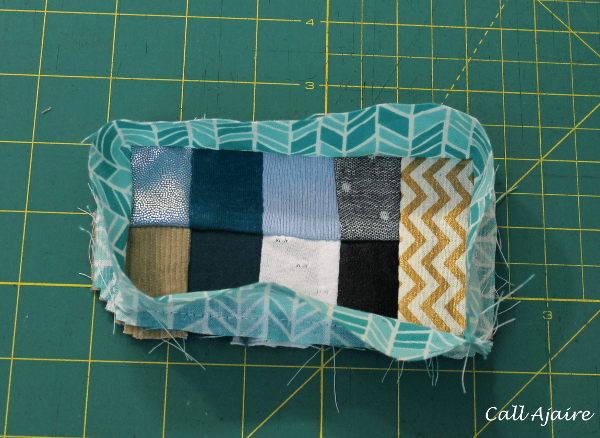 Press the corners a bit so the fabric will have a “memory” of how it should stand once the pincushion is stuffed. 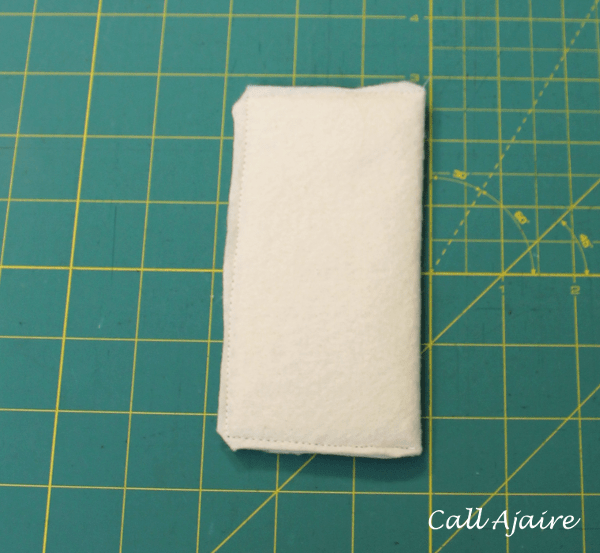 Sew the two pieces of felt together with the cardboard sandwiched between. This will add a bit of cushioning and also help the cardboard stay in place inside the pincushion. 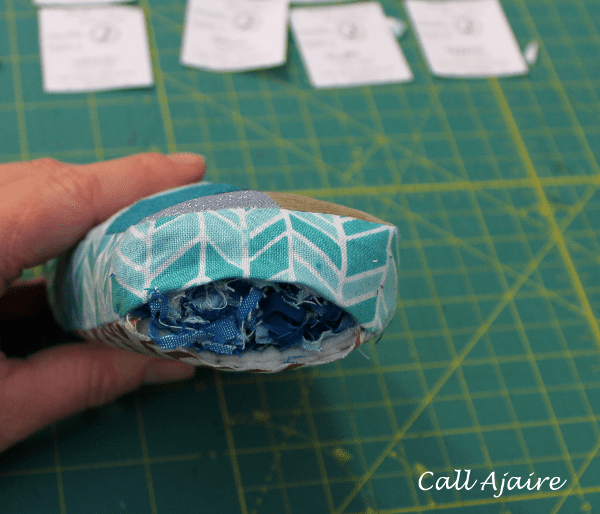 Sew the other edge of the side band to the base main fabric, right sides together, in the same fashion as the top, leaving one short edge open to insert the cardboard base. Take care to line up the base corners on the same vertical plane of the side band as the top corners so nothing gets twisted. Insert the felt covered cardboard into the pincushion, pushing it in place against the base. Gather whatever you will use to stuff your pincushion. I used a some of my tiniest scraps and serger run-off. Stuff the pincushion until it is nice and full and will maintain its shape. It may help to use a popsicle stick or something similar to push the stuffing to the edges. 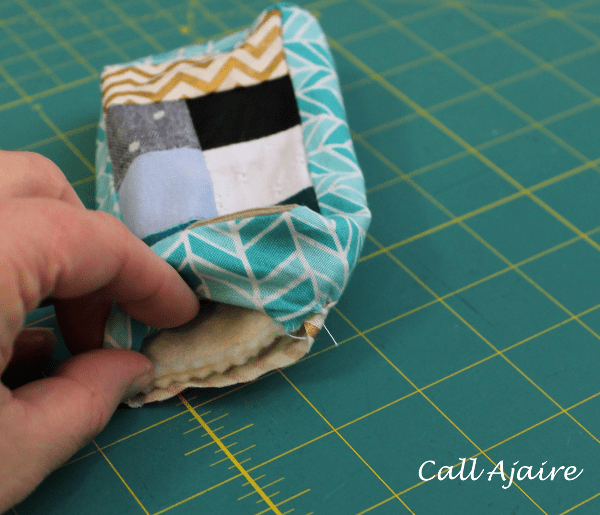 When you are finished stuffing, you’ll need to hand stitch the opening closed. Here is a view of the bottom after it’s been stitched closed. 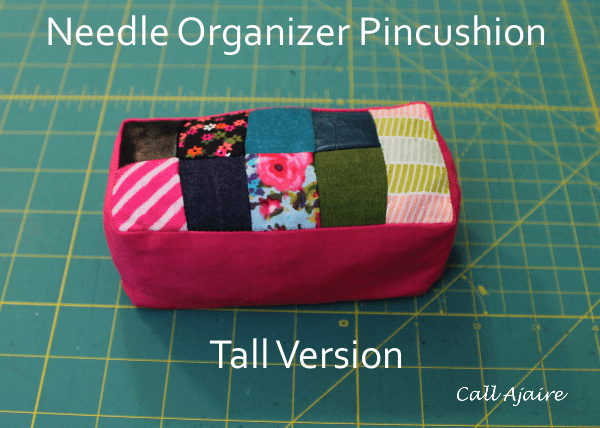 The picture above is a reminder of what the Tall Version of the Needle Organizer Pincushion will look like and the picture below is what the Shorter Version will look like. If you have any questions about the construction of the pincushion don’t hesitate to ask! I love both versions so much and can’t believe I only finally got around to making them. No more fumbling for the right needles for me! How perfect! 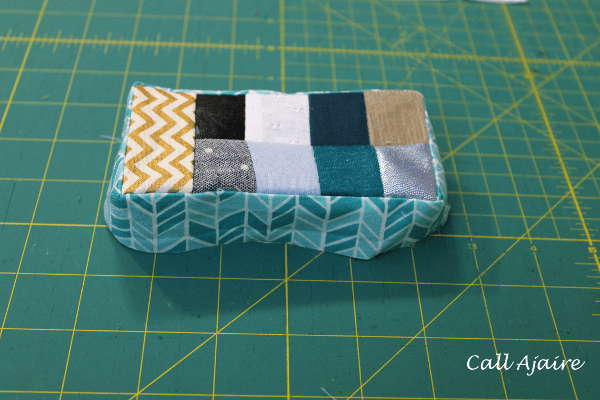 Pinned it to my Organized Sewing Room Pinterest board! Thanks!! This is really quick to make and is super useful! That's an awesome idea!! I need a new pincushion too. Genius genius genius! Pinning this and making one as soon as I can. Seriously. Brilliant. You already know I think this is genius! Love it! I've thought about a pincushion that had spots for certain needles but I never thought about actually using the type of fabric for each kind of needle ! I have a round one with colors and keep thinking I should designate a color for which type of needle but I never do and then I'm frustrated that don't know which needle is which. Now we need to figure out a method to remember which kind of needle was left in the machines! I swear I will remember every time but then I got back to it and can't remember if I changed it or just thought about changing it! What a super idea! You're a clever cookie, as my Mom used to tell us kids, hehe. How great! Thanks for your tutorial and all the great photos.